There is one simple mission at Deliveroo, and that's to bring the best restaurants to wherever you may be, in a flash! Initially brought over from the Big Apple (where else? ), Deliveroo was built on the madness behind the fact that getting awesome, quality food delivered, just wasn't a possibility! Built with you in mind, the selection of Deliveroo restaurants is diverse and can range from your local family-run Italian restaurant to a renowned pizza chain. More importantly, you will only find delicious food here, so you’ll never really be taking a gamble on your all-important takeaway. Deliveroo is the easy way to satisfy all your foodie cravings! This is dreamy food delivery for sure, when you can order everything just how you’d like it. A pizza with double olives? Sure, you’ll have all the usual restaurant options available to you and for specific allergies or food concerns, you can simply get in touch with the restaurant directly to ensure that they can take it on board when preparing your order. Perfect for a weekday treat, to jazz up a day in the office or as a great excuse to not leave the house on a weekend - that’s why the world loves Deliveroo. How do I use my Deliveroo promotion code? Choose your offer or promotion code to copy and head to deliveroo.ie using our link, or open the app. Find your location to see which restaurants Deliveroo can bring to you and pick your favourite from the bunch. Add what you’d like off the menu to your order and when you’re ready, select ‘Go to Checkout’. Your discounts will be included, or you will be given the option to enter your promotion code. Simply check out with your Deliveroo savings and start looking forward to your delivery! For free foodie tips and for the latest Deliveroo news, plus restaurants or menu additions near you, simply get on the Food Scene. Can you pay for Deliveroo with cash? Deliveroo only accepts card payments as it creates a safer and more seamless order process for both you and the drivers! Can I track my Deliveroo order? You’ll be given an estimated delivery time when you order, if yours seems to be running late, Deliveroo will let you know while they do their very best to ensure that you get the goods asap. Can I work for Deliveroo? If you love Deliveroo so much that you want to be part of the team yourself, read up on how to become a roo yourself online. There will be a small delivery charge of €2.50 for orders below a €15 subtotal, so you may as well order that cheeky side dish! If you’ve encountered any problems with your Deliveroo experience, simply contact support@deliveroo.ie or call +353 1 526 8611 to speak to a customer service advisor. It’s raining and you’re sat at home or stuck in the office on your lunch break - you’ve got a real hunger brewing - but there’s no need for tears when Deliveroo is in Ireland. That glimmer of hope, Deliveroo puts you in touch with the food you want, and fast. We’re not talking any old takeaway either, with a Deliveroo promotion code you can truly indulge in all of your favourite cuisines. Whether you fancy a swish Chinese from your favourite restaurant, or need to fulfill that pizza craving, Deliveroo will deliver all the goods. 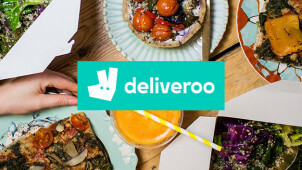 If you’re new to Deliveroo or fancy being a little more adventurous and trying something different, you can choose something from the ‘Deliveroo picks’ section to see where you can find great grub near you! Simply pop your location in, and from Cork to Dublin you could be munching on falafel within the hour or dipping into some sushi when your favourite soap is about to start. The Deliveroo app is convenience at its best. One tap here and another swipe there, in 5 minutes flat you could have a decadent burger or a mammoth Indian meal being prepared for delivery straight to your door. Ideal if you’re on the way home and haven’t got a moment more of hunger to waste, while a Deliveroo voucher is more than ideal to let you settle the bill for less too! Download the app via Google Play or the App Store and then you’re fully prepared for every foodie moment.